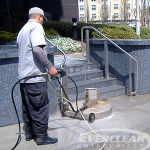 Performed properly by trained personnel, pressure washing can be a very effective approach to maintaining the aesthetics of many of the vertical and horizontal surfaces found in commercial real estate. In the hands of an inexperienced worker, however, pressure washing equipment and chemicals can be very dangerous and cause very expensive damage to your property within a matter of seconds. Further, improperly disposing of certain types of contaminants and harsh chemicals can also result in stiff fines levied by the EPA. Everclear Enterprises, Inc. brings the very latest in commercial-grade equipment, technical knowledge, and safety to every project. Our trained professionals understand which chemicals will work best on a particular type of stain without damaging the surface they are cleaning or the immediate surroundings. They understand when to use hot water and when to use low pressure rather than high.